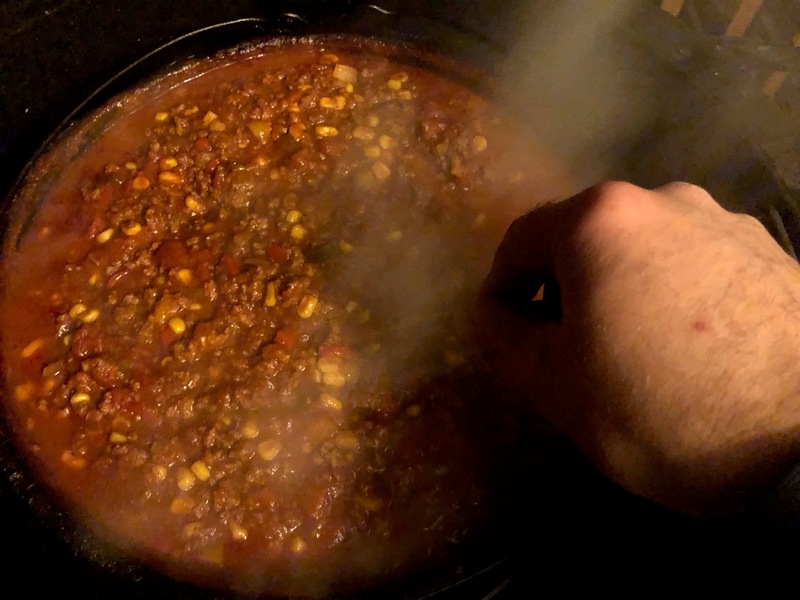 Everyone loves easy chili recipe here's one that you will definitely love! 7. 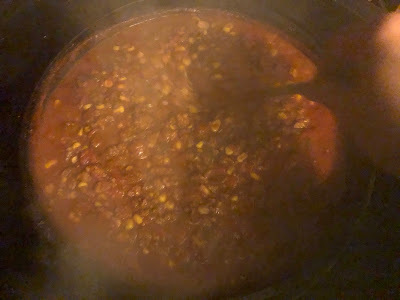 Grill for about 4 hours or till the chili is at your taste and thickness. For over a year now, I have been on the hunt for the perfect rotisserie basket for my Joetisserie. 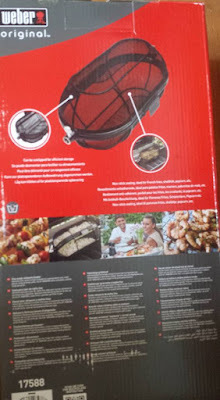 A month ago, I came across the Weber Premium Fine Mesh Rotisserie Basket on Facebook in a grilling group that I belong too. 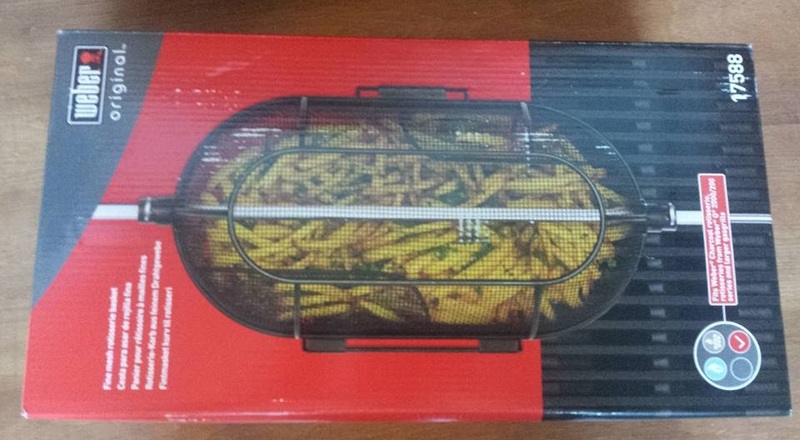 Unfortunately, this rotisserie basket is not available for sale in North America but only available overseas. Therefore, I decided to order one anyways from amazon from overseas. I took about a week for the basket to be delivered to my door by FedEx. The basket was very well packaged and arrived intact. 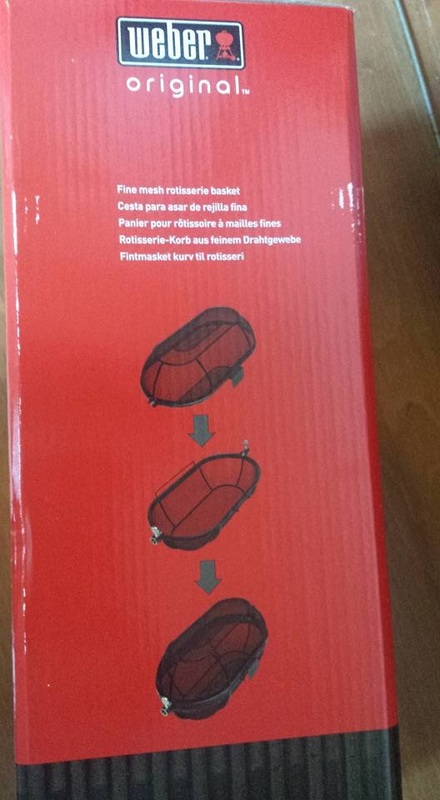 Weber took great care in the packaging of the Weber Premium Fine Mesh Rotisserie Basket. At the first glance at the basket, you can visually see lots of care was taken in its design. It’s very well built and you can visually see that its built to last. I love the fact that you can split the basket in half for easy cleaning. The basket is made of fine mesh steel, which is coated with a ceramic coating which is non-stick. I like the fact that it’s indeed dishwasher safe. The fine mesh design makes it perfect for roatissering very small items such as peanuts, coffee and even for making popcorn. In addition, there is no need to worry about food falling though the gaps that this fantastic accessory for your BBQ spit or Joetisserie. The rotating action allows your food to self-baste and reduces the need for cooking oils and grease; create a healthier grilling while still achieving a wonderfully crisp result. The hinges to which the two basket halves are connected are simply two elongated metal hooks into which the hinge rod of the counterpart must be pressed. This is exactly what you have to do before and after using the basket, if you want to clean it and connect it to save space. The basket is placed on the spit over a two-square feed-through and then secured to the rod with a wing screw on each end of the basket. The basket can then neither twist nor slip which is good to see. 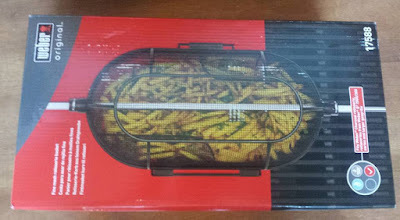 The basket itself is 16 3/4 inches in length and the inside of the basket is 14 inches wide in the open position and the inside diameter of the basket cooking surface is 7 1/1 inches wide which gives you plenty of space for food. One side of the basket has two flaps/paddle to help the food from sticking together for more efficient grilling while roatissing on the spit/Joetisserie. As you can see in the following pictures the latch mechanism of this basket is very well designed and it actually holds the basket securely shut during the spinning. 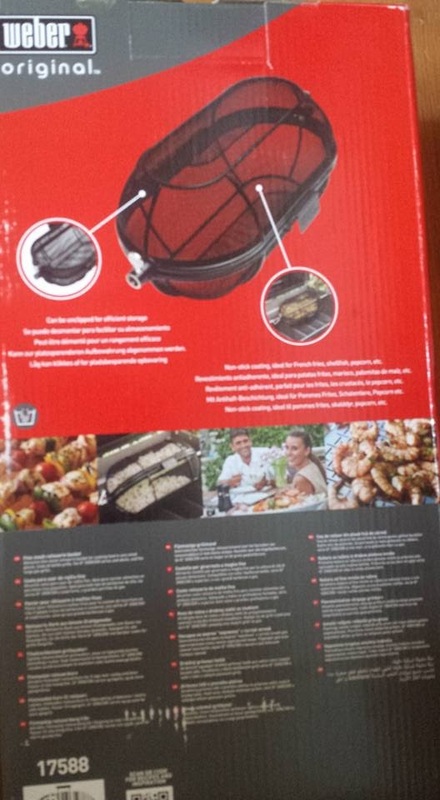 The Weber Premium Fine Mesh Rotisserie Basket fits perfect on a classic Kamado Joe. I first tried French fries using this basket with a minimal amount of oil; the potato pieces became very crisp. Although it takes much longer than in a deep fryer, the advantages are healthier heating and I found them more flavorful. Popcorn is also very fun to do with this basket ounce almost done popping you can give them a little seasoning while its rotating on the spit. Well after playing whit this basket for a couple of week I found the easiest way to clean this basket is to use a large pale with hot water and soap. Place the basket separated in two pieces in the bucket of hot water and soap and let her soak for 10-15 minutes then everything rubs off easily with a rag. Then ensure you to dry the basket completely using a dry rag. You can also use a dishwasher but I personally find that it takes to much room in the dishwasher and that the pale method worked best. This Weber Premium Fine Mesh Rotisserie Basket is built to last if you properly take care of it. 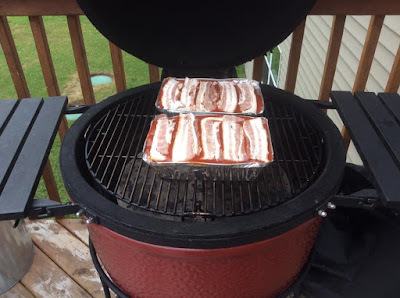 I personally love this basket a lot better then my fill it grill it basket which had the issue of the door popping open ounce in a while during cooks and was cumbersome to put back together after cleaning. 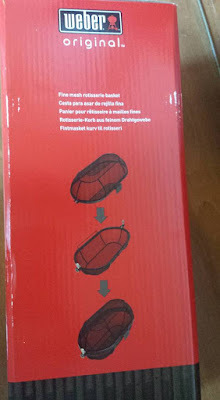 I am very disappointed that this Weber Premium Fine Mesh Rotisserie Basket is not available to the North America market since this basket is definitely one of the best rotisserie basket on the market. I strongly recommend this basket to everyone that owns a Joetisserie or a spit. 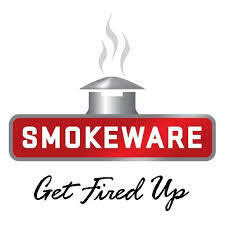 Today I decided to grill a brisket in a non traditional method that I seen chef Eric W Gephart from Kamado Joe used in one of his videos online. The traditional method of doing a brisket is using a dry heat method. This non traditional method will use a Dry heat and the wet process of steaming, brazing, and convection. This is achieved by smoking the brisket for 3 hours then it get very interesting by wrapping it in a thick grade saran wrap and foil then on the grill again for 12 hours. 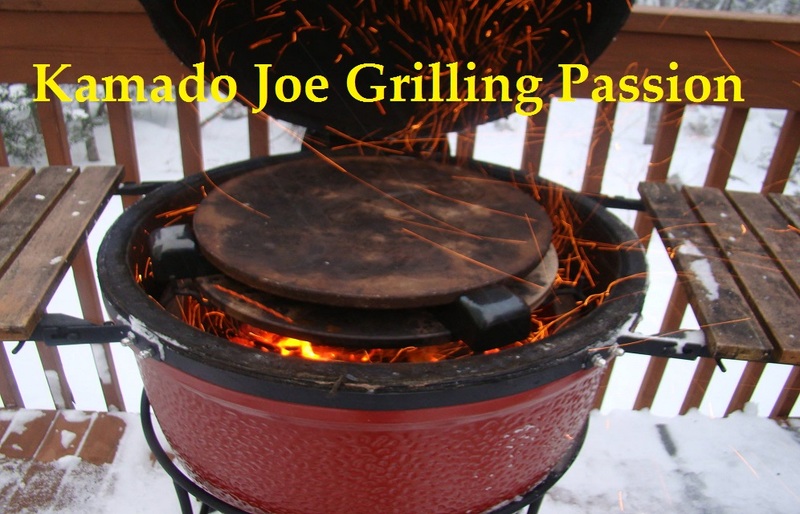 As long as we keep the grill under 236 degrees the wrap will not melt or burn. However to be on the safe side I recommend keeping the grill between 200-220 degrees. The brisket will be so tender that you will have to be very careful when removing it from the grill. This method makes brisket that is so tender and flavorful. It actually melts in your mouth. 4. Now liberally apply the dry rub, to the fat side making sure to get it in all of the channels you made by scoring the fat cap then wait 30 minutes then flip and rub the other side. 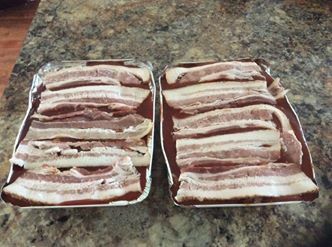 Now wrap the brisket in saran wrap and refrigerate overnight. 9. Place the wrap brisket on the grill again and cook for another 12 hours or till internal temp reaches 195 degrees. 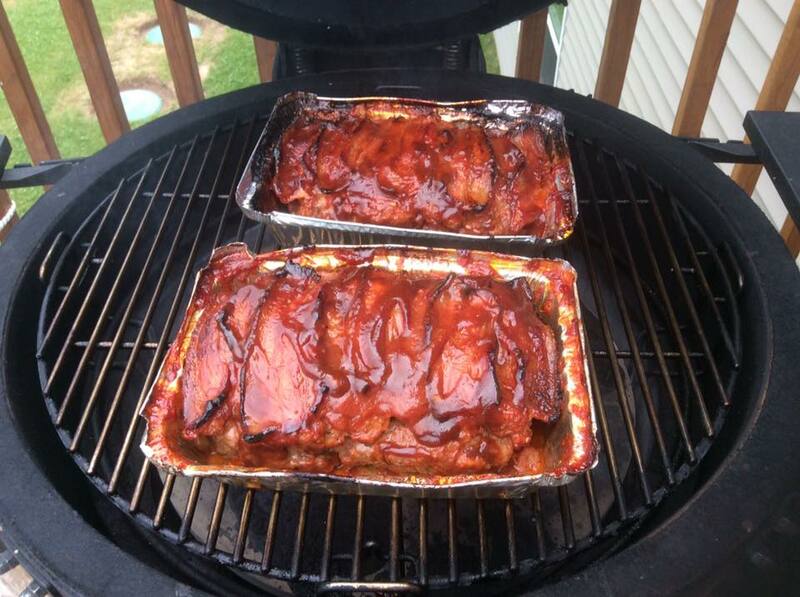 Its imperative that you do not allow your BBQ to go over 220 degrees for this phase. 10. 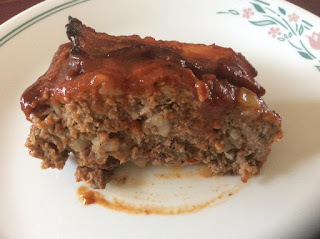 When ready be very careful when removing it from the grill since it will want to break apart since its so tender also carefully take it out of the wrap and gently place it on a cutting board and let it rest for 10-15 minutes before cutting and serving. Here's my BBQ meatloaf recipe that I have been using for a while now. Mix together the beef, bread crumbs, onion, garlic, egg, salt, pepper, onion powder and 1/2 cup of the sauce. It’s now time to roast them in the BBQ till internal loaf temp reaches 160 degrees.